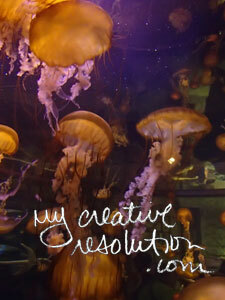 I originally wrote a version of this post just one month into my creative resolution. Almost two years later, many of these ideas still work for me! The biggest change since then? The inspiration I get from others through social media. Scroll through your feed or do a search on WordPress, Instagram, Pinterest, etc. – there is so much to look at and be inspired by! Take a walk. Whether it is a walk in a nature preserve, along the beach, or through the neighborhood, you’ll notice things you’d never see driving by. And if you see something inspiring – take a picture! Find a photo. Look in magazines, catalogs, or your own photo library. Keep photos you like in a folder or hang them on a corkboard. Search Google or any social media. 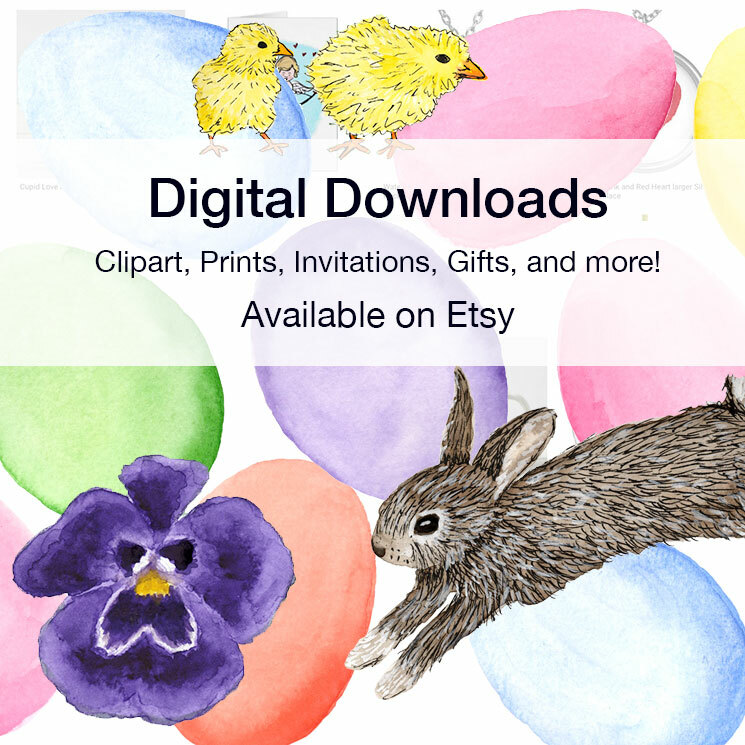 Virtually save links using tools like Pocket or pin stuff to your Pinterest boards. See mine here! Go to the library – where there is an endless supply of art and how-to books, and magazines on any subject. Just start. Once I get started drawing or painting, the ideas come. Sometimes ideas come to me, by just setting up! Keep a list of project ideas. I keep a notebook with an ongoing list of ideas and refer to them when I’m stuck. Look through old sketchbooks. I try to keep everything, because I enjoy seeing the progress I have made. Sometimes I find the start of an idea. Have coffee with friends. Find a creative friend, or two, and get together with them. When you share your ideas with others, you can get great feedback, and different points of view. Sit outside. I am so inspired by the Seasons – Spring flowers, the beach in the Summer, Fall leaves. I’m even inspired by the bare trees against the Winter sky. Ideas can come at any time from unlikely places. Soak them up! I’ve gotten ideas for paintings while watching TV, eating breakfast, etc. Categories: Inspiration | Tags: Art, art projects, creative, creative ideas, creativity, draw, inspiration, mixing paint, new ideas | Permalink. Take a walk. Whether it is a walk in a nature preserve, along the beach or through the neighborhood, walks can help you see things, you normally don’t have time, to notice. Take a picture! 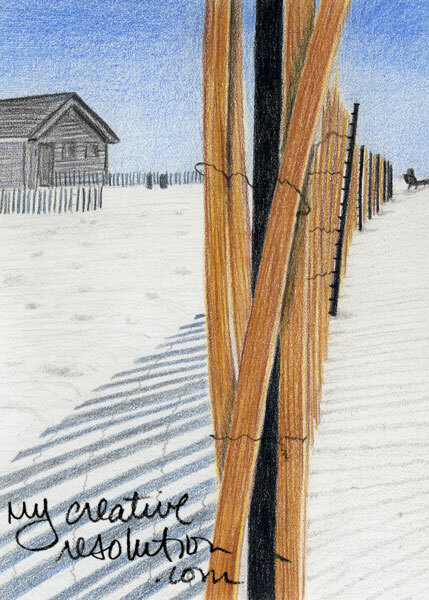 I’ve created several projects based on things I’ve seen on walks – a weathered fence, a zigzagging beach fence, a shell. On a route through the neighborhood, I see an old weathered garage, that reminds me of a barn. I’m often tempted to draw or paint it and add in a horse. Go to the library – an endless supply of art and how-to books, and magazines. I have to admit, the library is one of my favorite places. I often go there and sit down with my favorite magazine, “Country Living.” It definitely inspired me, during my “rooster” phase. 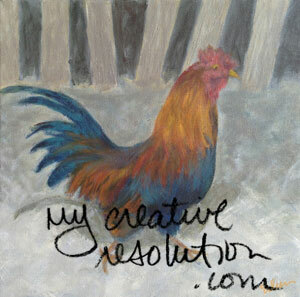 Why else, would a girl, from the suburbs, paint and draw so many roosters! Find a photo. Look in magazines, catalogs, the internet or your own photo library. We can’t always photograph, every idea we have. Stock photography websites, allow you to “search” for photos of specific things. Tear out and keep photos, for future projects, when you see something that catches your eye. Read about other artists (in books, magazines and the internet). I love reading about other creative people, no matter how different their craft is. There is something inspiring about people, who focus and succeed at what they love. I aspire to be that type of person. I love learning about each artist’s creative process. Just start. Sometimes it helps, to just get started. 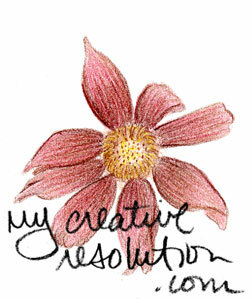 Start doodling or painting and see what evolves. Keep a list of ideas. Without lists, I would forget all my ideas. I recently came across a list, that included the word “jellyfish.” It reminded me of the cool jellyfish I took photos of, at an aquarium, and wanted to paint. I make lists on scrap paper all the time, but now I’m trying to use a notebook. This way, all my lists are together and I won’t lose any great ideas. I often thumb through my notebook, to look back on what I’ve written. I feel very accomplished, when I can check off a project I’ve completed. Look through old sketchbooks. I try to keep everything, because I enjoy seeing the progress I have made through the years. Sometimes I find an incomplete project or an idea, that I never fully developed. Have coffee with friends. I am lucky enough to have two great neighbors. I always feel inspired after getting together with these special friends. I hope I inspire them, and encourage them, half as much as they do me! They give me the positive reinforcement, I sometimes need. (Anyone out there want to leave a comment? please? lol!) Find a creative friend, or two, and get together with them. When you share your ideas with others, you can get great feedback, from different points of view. Go shopping! 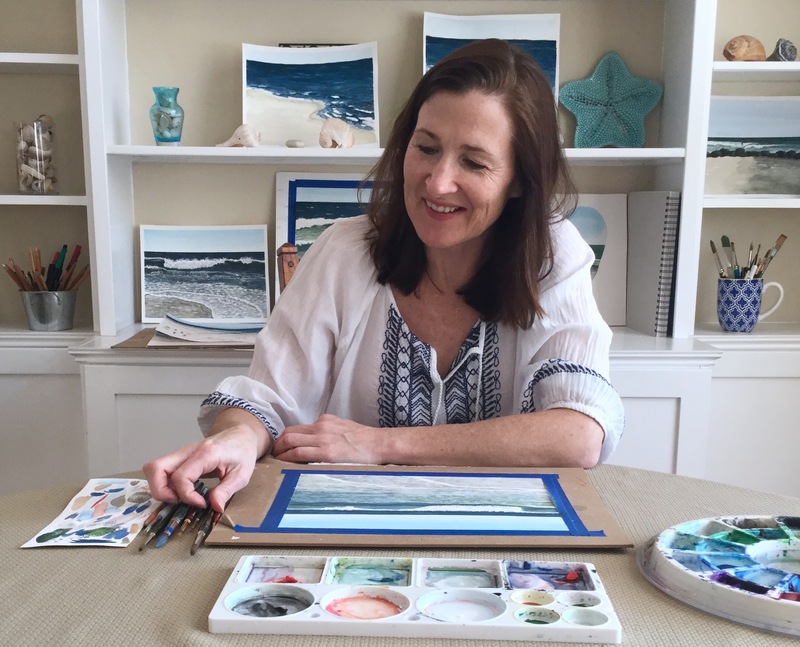 Walking through a home store, art store, or even a garage sale can inspire me. Whether I get a specific project idea or just get excited to work on something, it feels good. Go outside. When the weather is nice, I often sit outside, and sketch leaves, flowers, etc. Keep your eyes open. Ideas can come, at any time, from unlikely places. While watching TV, I saw a painting of an orange slice, on Modern Family (in Gloria and Jay’s house) and was inspired. I decided to work on an orange slice of my own, which led to limes and, currently, an apple slice. It’s funny, sometimes there isn’t enough time, for all the ideas and projects I want to work on! How do you come up with ideas? Categories: Uncategorized | Tags: Art, art projects, draw, inspiration, mixing paint, new ideas | Permalink.